November is inaugurated by two important religious feasts in Italy: All Saints Day and All Souls Day, on November 1st and 2nd, respectively. These are very important days in the Catholic tradition and their roots can be found deep in its past. La Festa di Ognissanti, or the All Saints Feast, is a religious event celebrated ion November 1st. 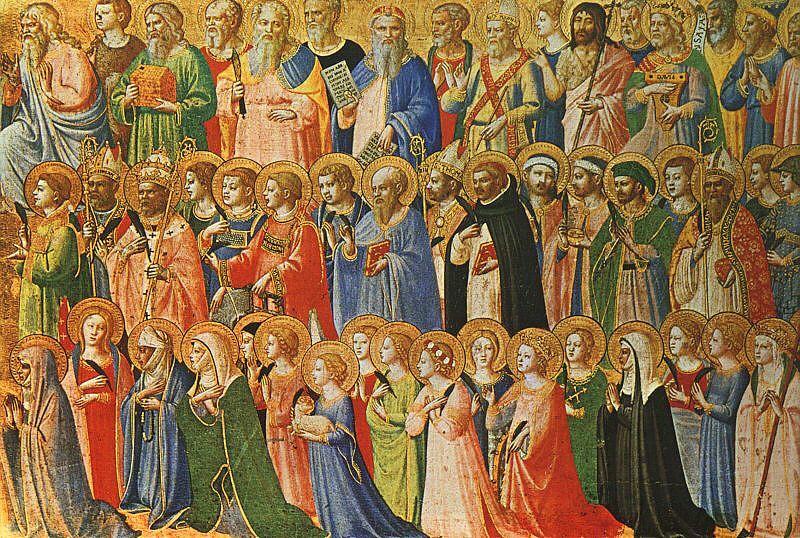 This feast celebrates all the saints of the Catholic calendar. The origins of this feast date back to very ancient times. In fact, records exist of celebrations held in honor of Christian saints even during the very first centuries of the development of Christianity. Writings related to the dedication by Pope Boniface IV of the Roman Pantheon to “Mary and all the martyrs” on May 13th 609 AD can be considered as the symbolic text inaugurating the tradition. Over the course of time, the feast was moved to November 1st for reasons that are still unclear. There are claims that All Saints Day was moved to November by Alcuin, the counselor of Charlemagne, so that the Church could christianize the pagan feast of the Celtic New Year, which allowed for celebrations to last three whole days. Whatever the reason, it was decided that the feast would take place in November and, as of June 1st, 1949, the Italian Constitution listed the day of Ognissanti as a public holiday. This feast is directly tied to the celebration of All Saints Day, and follows it directly on the calendar, on November 2nd. The direct link between the two days can be traced back to 998 AD, when the Abbot Odilo of Cluny established the day to remember the dead should follow the day celebrating all the Saints, mainly because the dead were believed to be able to intercede with God for the living, very much like saints. It is also not surprising that Catholics chose to honor the dead during this time period. Many ancient civilizations celebrated the dead in the months of October and November, likely owing to the fact that the coming Winter was in direct contrast to the rebirth of Spring. The date of November 2nd is also connected to the Day of the Deluge as told in the Genesis, hence making many people believe it was chosen to remember those who perished during it and exorcise another similar disaster. All Souls Day has a common denominator in many parts of Italy: the belief the departed will visit that day. Even though it is a religious event, there are many popular traditions that remain alive to this day, which combine pagan and Catholic elements. The entire country is united in celebrating All Saints and All Souls Day by honoring the dead, a habit mirrored in the loving care taken in the weeks running to those days in preparing, cleaning and decorating graves, in a manner which is extremely close to that typical of Mexican and, more generally, South American tradition. In certain areas of Italy, some peculiar habits stand out more than other, habits that find their roots in tradition, heritage and the undying love for those who no longer live that accomunate us all. Lombardia: in some parts of this Northern region, people put a bottle of fresh water in the kitchen so that the dead can quench their thirst. Veneto: people offers traditional biscuits, known as the “ossi da morti” (the bones of the dead), to their lovers. These cookies are popular in other regions of the north, such as Piemonte, as well as in Sicily, albeit recipes differs slightly from an area to another. Piemonte and Val d’Aosta: just like in Trentino Alto Adige, the table is often left set for the dead to feast. In ancient times, the Romans used to eat next to the grave of their relatives in order to keep them company. Sicily: people let kids believe that, if they pray and they are good, they will then receive gifts from the dead. Whether these beliefs are true or not, the day of All Souls represents an important feast honoring loved ones who have passed. A little bit religious and a little bit pagan, the true essence of this feast includes visiting cemeteries and remembering the dearly departed. Together, All Saints Day and All Souls Day are important dates on the calendar for Catholics and Italians alike.